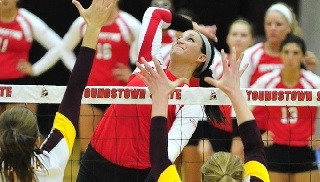 The Youngstown State volleyball rallied from a two-sets-to-one deficit and took the fifth set 16-14 to beat Coastal Carolina in the 2013 season opener for both squads. The Penguins won the first set 25-20 before dropping the next two 25-23 and 25-20. YSU won the fourth 25-21 and jumped out to a 7-1 lead in the fifth. The Chanticleers rallied and tied the score at 14-14, but Aly Ryan collected the final of her 15 kills for the side out. Chelsea Guerrieri's ace on match point gave the Penguins the victory. Ryan and Alexis Egler both finished with 15 kills, and Ryan's came on an impressive .364 hitting percentage. Egler and Erika West both finished with 19 digs, and three other Penguins added at least 12 digs. Casey D'Ambrose posted 45 assists, and Jenna Cavanaugh contributed six kills and nine blocks. Missy Hundelt had nine kills, seven assists, five aces, 19 digs and three blocks in a solid all-around match. "We are very happy to get the win over a good Coastal Carolina team," YSU head coach Mark Hardaway said. "We are a little limited with some injuries, so we had to work ourselves out of some jams without the luxury of subs. Overall it was a good team effort." "Aly Ryan was a big key to our win tonight. She was our go to player and found ways to get kills. We expected out defense to be strong, and it was tonight. Jenna's (Cavanaugh) blocking was strong, and we had five players with double digit digs. It was a good start to the year." Lian Bernett had 14 kills to lead Coastal Carolina. Youngstown State will play two matches tomorrow at the Coastal Carolina Tournament. The Penguins and Iowa Hawkeyes will play at 1:30 p.m., and YSU will square off with Wofford at 4:30 p.m.